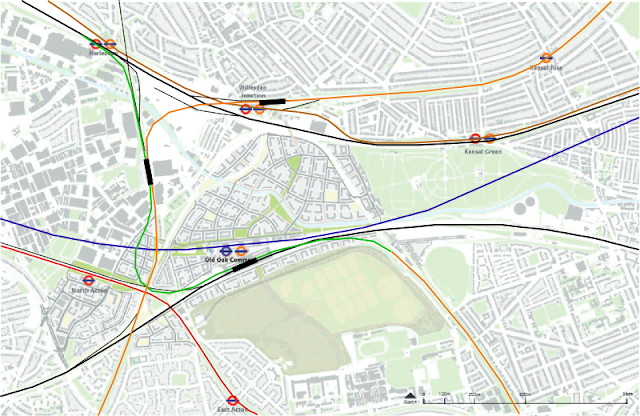 A new cost-effective phased option for Old Oak Common. See the Central Viaduct option post for more details on the problems of the site and for a more comprehensive, but expensive, option. This option makes use of the proposed Crossrail to West Coast Main Line (WCML) link, avoiding building a second sharp curve in the South West of the site (as proposed by TfL's option A). Phase 1 builds on the planned construction of the Crossrail link from Old Oak Common (main) to the West Coast Main Line. 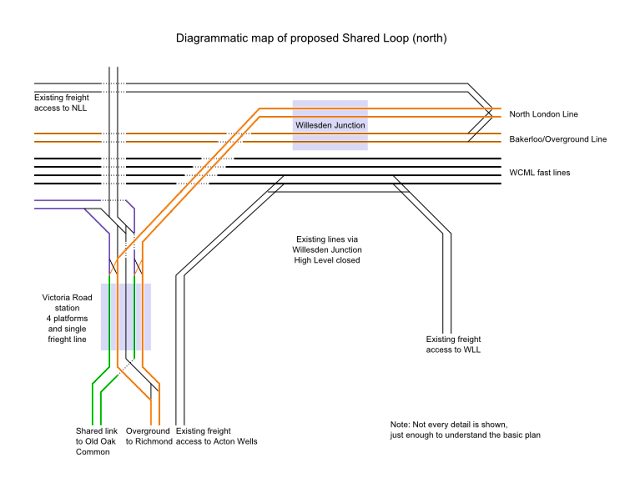 Phase 1 of the TfL element simply adds a new viaduct link from the West London Line to the middle two platforms of Old Oak Common (main). 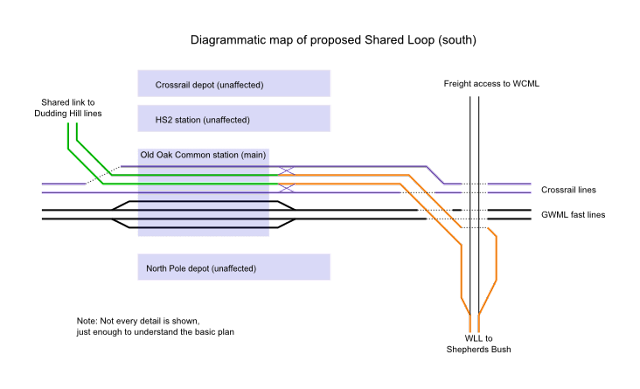 This allows Southern services (green) from East Croydon to Milton Keynes to travel via Old Oak in addition to the Crossrail services to Tring. Obviously, the final phase does not integrate Richmond services directly with HS2, but it does link it with Crossrail (the Tring services). Linking Richmond into the main Old Oak station would require two more platforms to cope with demand, which is a big ask at this initial stage. As a final note, all the phases are compatible with extensions to link Old Oak Common to North Acton (and beyond) and to open an Overground route to Brent Cross. Update 14th October 2014: See the updated phase 3 map here. Section added 28th September 2014. This option was triggered by the release of the Crossrail to WCML link plans. When you overlay that link and the option A viaduct over Wormwood Scrubs, you have two very similar pieces of infrastructure, just at different levels. 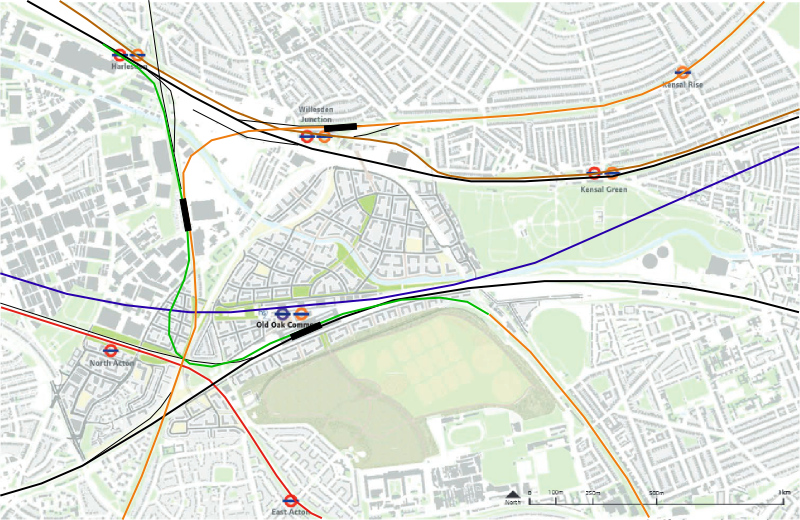 The Shared Loop makes no changes to the Crossrail plan save the ability to access the Dudding Hill line in phases 2 and 3 (in reality, some form of grade separation may be needed there). In terms of vertical alignment, the Shared Loop option involves a simple, low gradient descent from the WLL to the GWML/Crossrail level to use the OOC platforms. This naturally means that it is at the correct level to be able to access the Crossrail WCML link which ends up on a bridge over Victoria Road. From there, the later viaduct runs over the freight depot to Willesden, which probably requires a reconstruction of the Old Oak Common Lane bridge over the WCML (or a higher than originally intended viaduct). I would also note that with increasing land values, the freight depot area could be considered for sale, making that viaduct simper to build (looking forward 10 years). Finally, a key part of both the Central Viaduct option and this Shared Loop option is the goal of maximising the land available for development. The existing rail lines make the site difficult to access and develop, and fewer rail lines can have a big impact. Section added 7th December 2014. 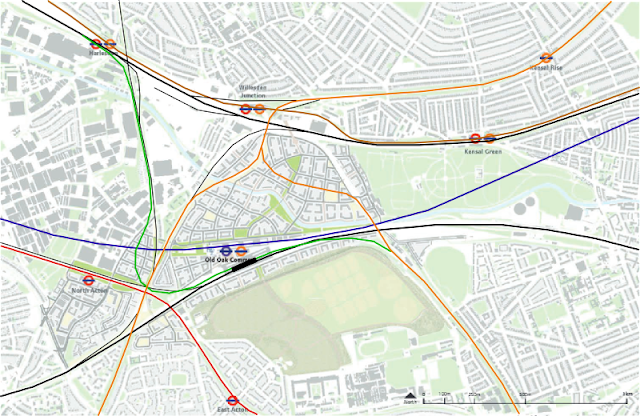 This blog outlines an alternate approach to Old Oak Common - the Shared Loop option. 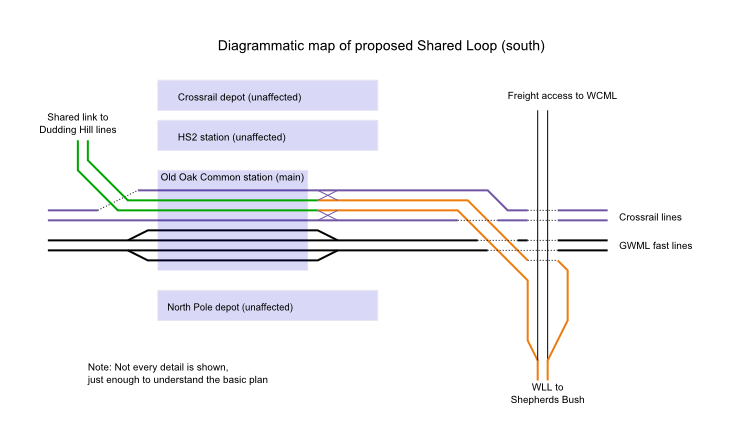 With respect to the proposed link from the WCML to OOC, I assume that the connections at both ends would be grade seperated junctions.It would be interesting to see a vertical section of the proposed link, radii of the reverse curves and anticipated speeds over the connection. An assessement of the changes in the timings for WCML travellers from Tring to places such as Victoria, Camden Town and Bank would be quite informative. See http://assets.hs2.org.uk/sites/default/files/event_speakers/LWM-HS2-EN-MAP-010-000002-P06.pdf for the document describing the proposed link. Thanks for the reference,but it is not at all clear how the proposed link is to be connected at either end. How can a £1.5 billion proposal have been tabled without a vertical section being done and without the effect on journey times being calculated? I believe that the consultation for the Crossrail WCML link is due to start in December. The pdf linked above has "emerged" indirectly, hence the lack of detail. Note that I do not represent TfL, Crossrail, HS2 or any other official organisation. I fully appreciate that you are an independent observer., and you are clearly not responsible for the answer not having been available with the proposal. I apologise if my text suggested otherwise; please keep up the good work!. No Richmond (or Houslow)-OOC interchange possible then? Richmond to OOC is achievable, but at a higher cost (the Central Viaduct option). 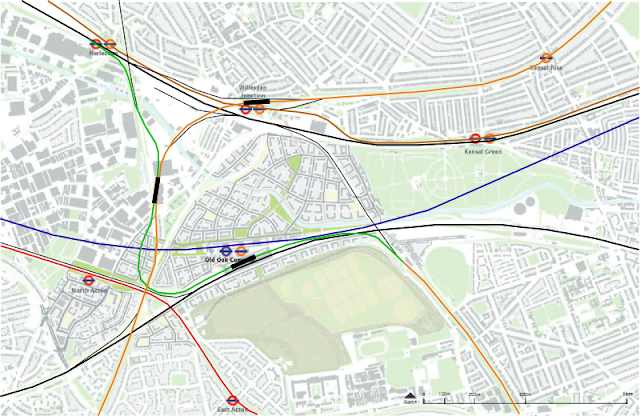 The Shared Loop option compromises, and focuses on the WLL and Crossrail. Richmond can still access WLL, Crossrail and Southern services at the Dudding Hill station, and OOC is a single change away (or a walk for employment rather than interchange). The plan could be altered to add a link from the Richmond route to the heart of OOC itself, a simple curve but one that results in a lot of questions that the Central Viaduct option had better answers for. Similarly, a station could be added on the Richmond lines above the Central line (linked to both North Acton and OOC by travelator, but that seems very awkward. The question of freight capacity is interesting and frustrating. It is likely that if the WLL is full with a combination of Overground and freight then there is not enough capacity to route the freights via OOC. As such, the eastern link to the WCML may need to stay, but I consider that an undesirable outcome as it restricts development. Perhaps more freight can be routed from Clapham via Chiswick and Action Central (the WLL needs to have more passenger and less freight in general). On the specific connections available via Shared Loop, you can get from the WLL to the GWML west, WCML north, Dudding Hill and NLL north. You can get from the WCML to GWML west, NLL south and WLL. Freight would be accessing the GWML slows, but I can't say what it would access on the WCML (as we don't know the details of the Crossrail Tring link plan there). The WCML can access the GWML today (via Acton Wells Jn) and I don't see that changing.